This is the first of three #FactInFantasy posts that she’s written for us about getting horses right in fiction. Hello there, readers of Dan Koboldt! I’ll be your guest blogger today, continuing a topic from a previous guest. I am here to help you aspiring novelists bring more realism into your use as the horse in fantasy. As with anything that a reader can be a specialist in, an author using incorrect or archaic terminology is one of the quickest ways to break the spell a book can have. When it comes to horses, some of the big indicators are involved in the description of the horse itself and the tack involved. Horse height is classically measured in “hands”. The unit itself originated as being based on the breadth of the human hand but is now standardized to four inches. So if you had horses, each an inch taller, they would be 15 hands, 15.1, 15.2, 15.3 and 16 hands each (15.4 = 16 hands). This system of measurement started in ancient Egypt and is most popularly used in English-speaking countries. There are other units that are used in regulated sport but for the novelist’s use, the hand is best. The height of a horse is measured when the animal is on level ground from the ground up to the top of the withers. The withers are a bony process that is most equivalent to the scapula of a human. It is the point between the neck and the back. So a horse that is 15 hands (hh) tall is 5 feet at the withers. It can carry its head higher or lower depending on its mood. 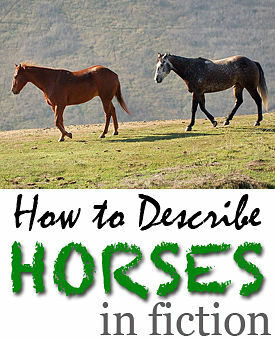 Within the height system there are additional classifications of equines from miniature horses to ponies to horses. I have seen some confusion in my perusal of the internet so I’ll state it here for clarity’s sake. A pony is not a baby or young horse. A pony is an equine that measures less than 14.3 hh when fully grown. 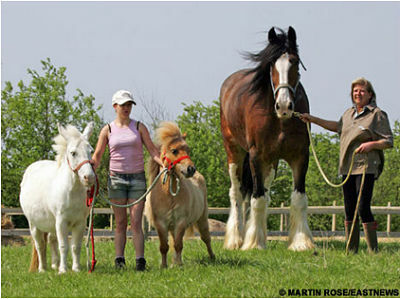 There are no specific height classifications for draft horses; that is determined by breed rather than physical size. Similarly, a miniature horse is a breed in itself, though it happens to be the shortest breed. Chestnut: The whole body is a copper to brown color with or without white markings and no black. Bay: A red-brown or chocolate-brown body with black ‘edging’ like a fox would have (for reference). So legs, muzzle, tail, mane and ear tips are black. With or without white markings. Black: A black horse in the summer is often a deep dark brown unless otherwise protected from sunbleaching. Grey: What most people would call a white horse. They are considered grey because their skin is actually black while the hairs are white and/or black. True white horses, where the skin is white as well as the hair is incredibly rare. In this case the horse would have blue eyes. Typically a horse’s eye color is brown or black. Albinos are unheard of and there is a thought that they are embryonically lethal. If you have any questions, please feel free to ask them! Thanks for reading!